Elvis is alive and well on the island of Malta in the Mediterranean. At least in Qawra, a seaside resort town from which I recently returned after a one week holiday together with my folks. 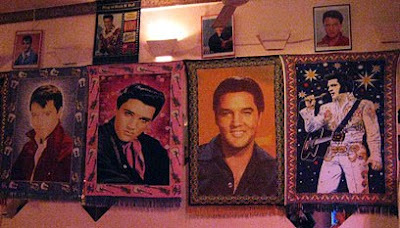 I'm always pleasantly surprised when I find things associated with Elvis when I travel. For instance, I still recall a visit to an Elvis pub in London back in 1985. For years after, my brother had a framed photograph on display showing him and me standing outside the entrance smiling happily at the camera. But back to the present. 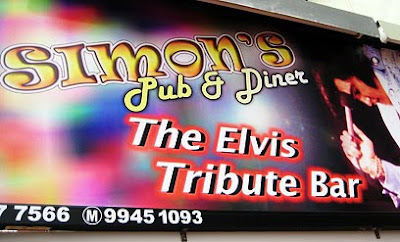 The day after our arrival in Malta we stumbled across Simon's Elvis Tribute Bar, located just outside the hotel. A lifesize Elvis stand-up guarded the entrance. 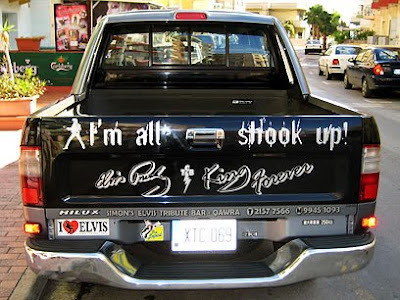 And parked right in front of the place was an Elvis truck. Needless to say, I liked Malta right away! As it was early in the day, the bar wasn't open, but the door stood ajar so I took a quick look inside. I found the walls packed with framed photos, prints and posters of Elvis, and on the bar itself I spotted a Elvis '68 Comeback figurine. Returning in the evening, we were welcomed by Elvis music and take after take of "As Long As I Have You." Here was proof if needed (as if the interior wasn't enough!) that the place was run by a real fan. I ordered Maltese beer and chatted for a while with the owner. Turned out he'd had the place for about 15 years. Here my post could have ended if it wasn't for another Elvis-Malta connection I experienced the same week. A few days later on our way home to the hotel after a pleasant dinner we passed another bar (what else!) and spotted an Elvis impersonator inside belting out "Amen." Walking inside, I was just in time to study "Aaron" leap into the ending of "I Got A Woman" and nearly expected him to throw his guitar away. But as there was no one impersonating Charlie Hodge, that of course didn't happen. Instead he continued with "I'll Remember You" and then "Stranger In The Crowd," which he did a pretty good job with. And guess what? The day after I noticed an advertisement for another tribute act called "The Elvis Presley Show." But that one I was gong to miss, as I would be back in Sweden by then. It didn't matter much. 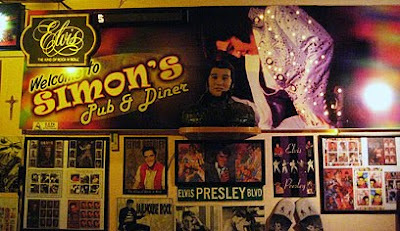 I returned to Simon's Elvis Tribute Bar and listened to the real thing instead. 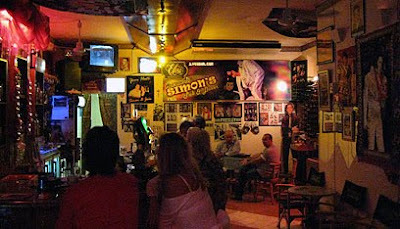 Inside Simon's Elvis Tribute Bar. The walls full of posters and prints. Even some woven carpets on one of the walls. Big sign outside the entrance. 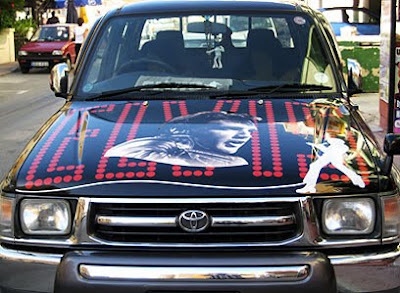 The front of the Elvis truck. Whole lotta Elvis tribute shows going on! Your blog is always a very nice read. And this one sure is a highlight. And the pics are a very welcome bonus. Thank you, Rocker! Glad you like my blog, and the pictures. 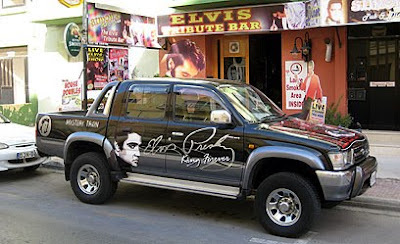 That Elvis bar in Malta really was something!